We're not too deep into double-digit territory, but soon to crack double-tens and as of today we've reached majority. Then again, the show still can't drink, though it can vote, and it can sit on a jury, though any judge worth her salt will recognize what an unreliable ruffian it is and kick it out of the pool. Out of the pool and into the fire…? In today's show, the two themes are simplicity and polarity, starting with the latter. So, buckle up, check your Segway at the door, and repeat after me, "huh?" Polarized light is a simple concept that is difficult to explain in mere words, but your humble (huh?) host gives it a shot. You see, Skittles can bounce any which way but loose, but when you bounce 'em loosely in just one way, they can be swatted out of the sky from whence they came with a polarizing filter, which doesn't actually polarize the light so much as block polarized light. See? Complicated. Still, listen in to the show and it is explained much more completely and simply (after a great deal of explaining). One thing that's easy to understand visually, though, is why you might use a polarizer — just look at these two images! Or the next two! I definitely need to use exclamation points!! This saguaro cactus reaching to the Arizona sky in front of the Superstition Mountains, also in Arizona, comes visually alive when a polarizer filter is oriented appropriately, also in Arizona. On top, the filter was oriented to, essentially, appear unfiltered while in the lower photo the filter was oriented to darken the sky, which allowed the foliage and mountainage to appear brighter and more colorful. The filter is also removing subtle sky glare from the foliage, reducing its blueness for purer color. 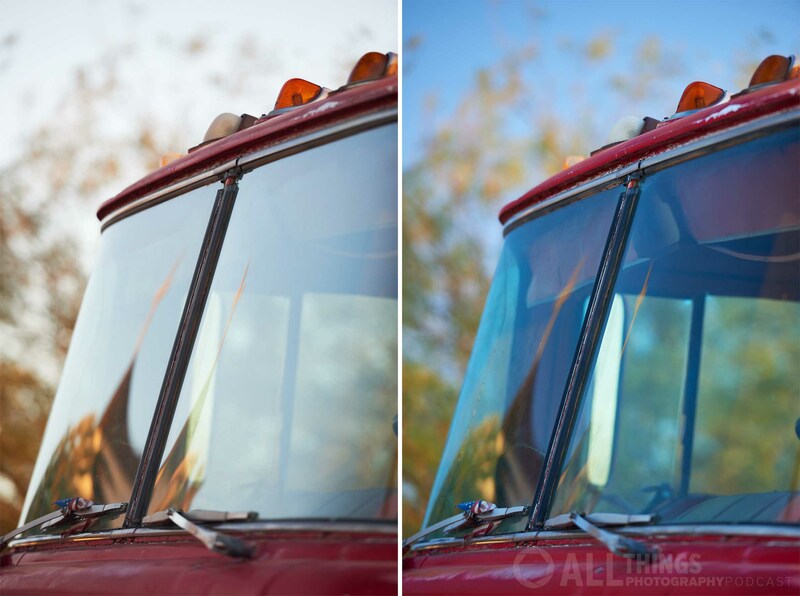 On the left, fire truck seen with the polarizer turned to have no effect, on the right, turned to cut the glare on the windshield. You see, also, brighter colors and a bolder sky throughout. Eleven individual frames were captured then pieced together to create this panorama of the northwest face of the Superstition Mountains. Notice how, by using a polarizer filter, the sky is darkened more in the direction of the mountain peaks. That darkening has nothing to do with the peaks, but is because the sun is ninety degrees to the right of where the camera is pointed when pointed at those peaks. When pointed to the left and right of that direction, thus more and less than ninety degrees to the sun, the effect of the polarizer filter diminishes. 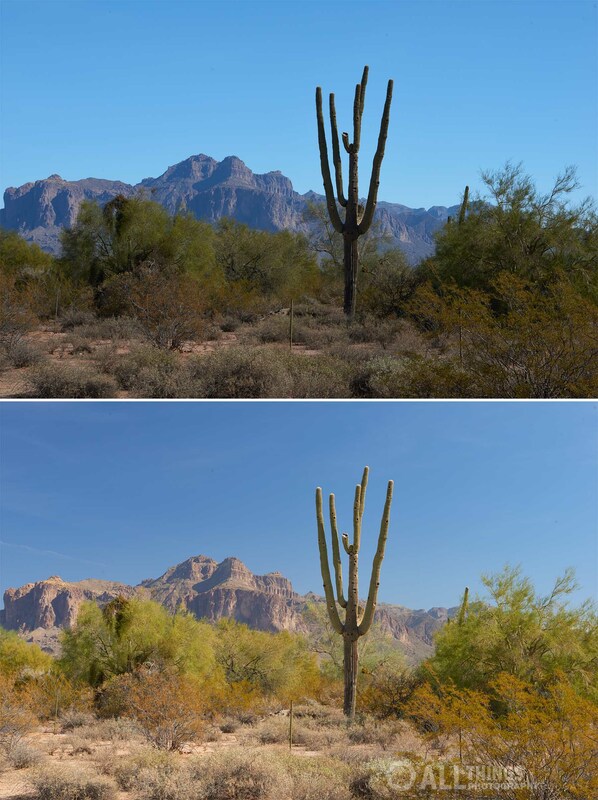 The examples of the effects of a polarizer filter, seen in all of the above, were the result of using a Breakthrough Photography X4 CPL filter. I had reviewed that brand's ultraviolet filter in Episode 16 and very much liked it, so I looked forward to giving the same in-depth look-see at their polarizer version. I deeped and I saw a lot to like. 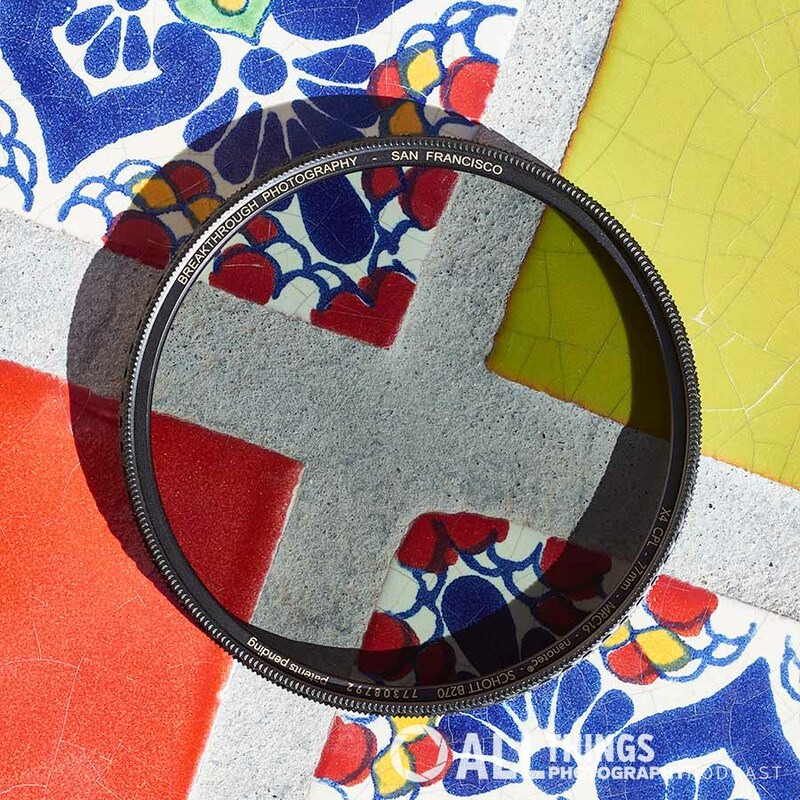 The Breakthrough Photography X4 CPL filter: it may look like a simple filter and, well, it sort-of is, but it's a very well engineered, designed, and manufactured simple filter. Their X4 line of filters share major traits, including high-quality German optical glass (Schott B270 Ultrawhite), 16 layers of anti-reflective coatings for improved light transmission, nanoparticle coatings to repel oil and water and dirt (plus easier cleaning of any that isn't repelled), brass rings and large nubs (at least that's what I call them) around the perimeter. That's all good, but what about the raison d'être for this particular product? As it turns out, they designed their own polarizing film, one they claim to be more neutral than any other filter on the market. That is, it adds the least amount of "color" to what should be perfectly accurate light transmission. I suspect atomic-level issues are at play here, just as polarized light from the sky is similarly an atomic-level result. I don't recall a color cast in previous filters I've owned, but maybe I was just used to that defect. The color cast Breakthrough Photography declares that they've minimized is in the slightly yellow cast of others and, indeed, I could detect a slightly less yellow cast to neutral elements in the images I made with the X4 CPL. Listen to the show for the complete review and, if you're in the market for what is possibly the best polarizing filter you can buy, do check this one out. You can learn more about it, specifically, using this link, or learn about all of Breakthrough Photography's products at breakthrough.photography. "When it comes to visual design, a key ingredient is simplicity. Its importance in photographic composition cannot be overstated." Strong words from a fairly soft-spoken guy. That guy is Peter Ensenberger, former photo editor of Arizona Highways magazine, who returns this episode to beat the drum of simplicity into the hard head of an oft-speaking guy, me. 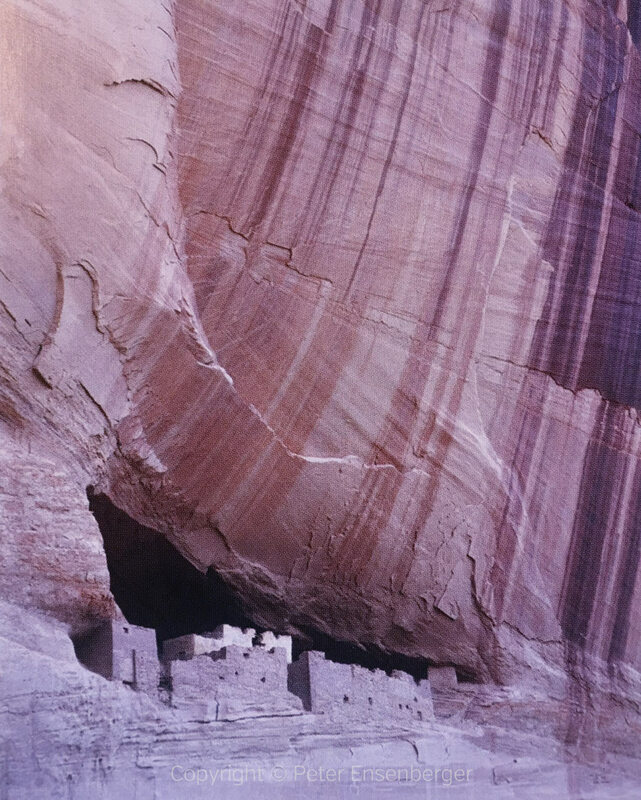 Getting closer would probably not simplify this view of these cliff dwellings — the textures and materials would become more prominent and, thus, interesting, and would then tend to dominate. From here, especially by including the stain-streaked cliff face, the buildings are not only simplified, but given a visual context. Photo by Peter Ensenberger. Peter and I are bouncing around his book Focus on Composing Photos, from Focal Press, for this series on composition. Today's topic is from chapter one, if you have the book and want to get extra credit for following along. You can also get the book on Amazon or from Barnes & Noble or, perhaps, from wherever you shop for books. Peter Ensenberger quoted another Peter in our conversation, Pete Turner, so I turned to Turner to turn out some quotes. Peter shared Pete's "Ultimately, simplicity is the goal - in every art, and achieving simplicity is one of the hardest things to do. Yet it's easily the most essential." I then give a little background about Turner's life and work, which you've probably seen even if you didn't know it was his, and share a few more words of his wisdom. 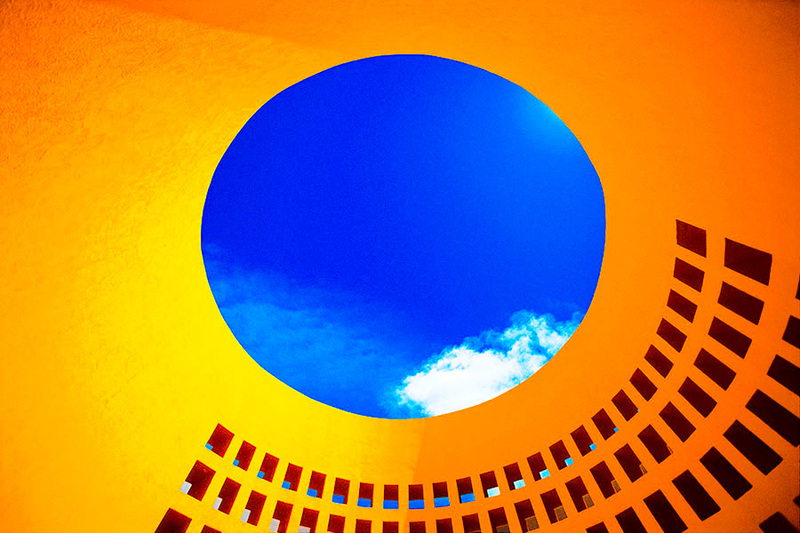 Here is one of Pete Turner's brilliant pieces — it exemplifies the bold color and contrast for which much of Turner's work is known: Cloud World, 2001 © Pete Turner. In Episode 3 I recommended that you "zoom with your feet" to more fully fill a frame with the subject of your photo. Peter Ensenberger recommended the same in our conversation today. That is, of course, not always practical, physically, nor does it always yield the desired result of cutting out the non-subject elements of a photo. Photographing Mount Everest from atop Mount Everest yields photos that might just look an awful lot like being atop K2 or Grakfajil (I made up the second one). So, sometimes the only or better tool for simplifying a photo, for narrowing the view and cutting out non-essential or distracting visual elements, is a zoom lens. This chapel was originally at the Apacheland Movie Ranch east of Phoenix. When most of the location's other buildings were destroyed in fires, the chapel was relocated a few miles away in an equally photogenic area. The widest-angle shot, in the upper left, puts the chapel in its location, but there are a lot of distracting details, from texture and markings in the dirt parking lot, to the jumble of cholla cactus, and even the white fence and one of the other fire-escaping buildings, the large barn. 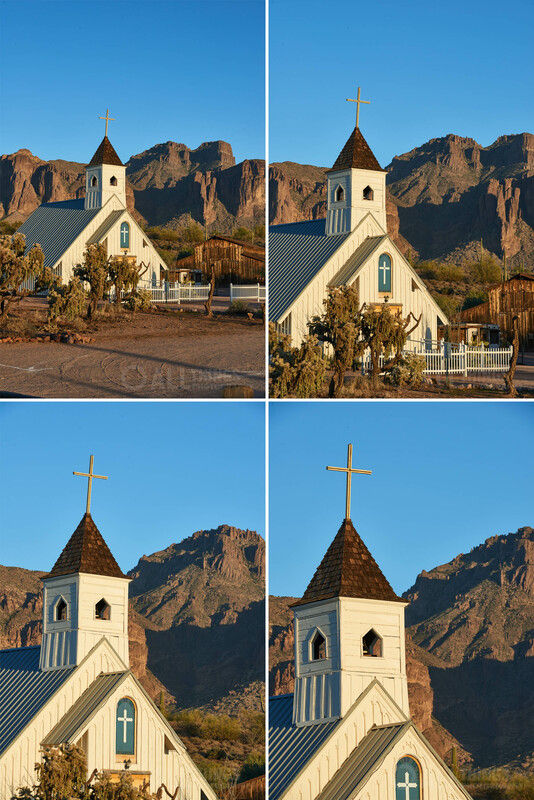 By zooming progressively tighter, the final image in the bottom right has simplified the "story" to "chapel near mountains." In this troika of images, the top image is totally unintelligible in terms of what we are supposed to be looking at. The tree? Ugh. The building? It's blocked by the tree. Cars? Seems unlikely. So, what!? The middle image seems to indicate that it is, indeed, the tree. But the cars and the building are still prominent enough to be distracting. The red umbrella in the bottom left, and a graphic version of same in the building tenant's graphic, keep grabbing our attention — even the car's tail light, seen through another car's windows, ends up getting some of our eyeball time. Finally, at the bottom, we've reached the end of our zoom lens' range, but did manage to excise all but some of the building — without the red graphic — and gone entirely are the cars. Without those other objects and colors we are finally near to understanding that the story is about fall foliage, or something along those lines. A great photo? Not really, but the series demonstrates the value of zooming the zoom. Where did the time go? In one ear and out the other, perhaps, but maybe some of what you saw or read got stuck between. I know I continue to learn a lot! Something else I'd like to learn is what you have questions-wise, or comments-wise, or even wisdom-wise, and I'm not kidding-wise. Your thoughts about the show, your questions about photography, your wishful thinking about world peace and low-calorie cake — and more — are exactly the kinds of things I want to know. So, type in a question or comment or low-calorie cake recipe, below, and if you go to iTunes to leave a comment and a rating, that'd be super sweet too. Thanks for listening and looking.